I hope everyone knows that the only regular convex solids are the tetrahedron, cube, octahedron, dodecahedron, and icosahedron: the Platonic solids. To generalise, we can loosen some of these requirements. Firstly, we can simply drop the requirement of convexity. In this case we add in four new Kepler-Poinsot polyhedra (we also have to tolerate self-intersection here – some of the faces crash through each other at ‘false edges’, and we are in the realm of polyhedra rather than solids). If we demand convexity, edge-transitivity and vertex-transitivity, but we allow the faces to be different, then we additionally win the cuboctohedron and the icosidodecahedron. Now dropping convexity, we obtain the great icosidodecahedron, the dodecadodecahedron, and three ditirigonal variants. If we only insist on convexity and vertex-transitivity and allow edges and faces to be different, then we get the thirteen Archimedean solids (of course including the cuboctohedron and the icosidodecahedron), plus two infinite families: the prisms and antiprisms ….that is at least if we restrict to convex vertex-transitive polyhedra with regular polygonal faces. Otherwise there are millions more, not yet fully classified. What else could we do? Well, we could let vertex-transitivity slide, and instead demand face-transitivity, edge-transitivity, and convexity. At this stage we’ll have to allow faces which are not regular polygons. But it’s worth it to win the rhombic dodecahedron and the rhombic triacontahedron. If we only care about face-transitivity and convexity (for example if we’re looking for the shapes that will make fair dice), we arrive at the thirteen sumptuous Catalan solids (including the deltoidal hexecontahedron pictured above, with its sixty kite (or deltoid) shaped faces), as well as two infinite families: the bipyramids and trapezohedra. What if we demanded only edge-transitivity but allowed faces and vertices to differ? Then we’d get nothing new! Any edge-transitive solid is also either vertex-transitive or face-transitive. However there are polyhedra which are vertex-transitive and face-transitive, but not edge-transitive. They are known as noble and are a little mysterious [pdf]. The only convex examples apart from the Platonic solids, are disphenoids: tetrahedra whose triangular faces are not equilateral. However there are non-convex examples too, such as the toroidal crown polyhedra. Again these shapes are not yet fully classified. Another way to generalise from the Platonic solids is to forget about transitivity, and get back to regular polygons. What other convex polyhedra are there whose faces are regular polygons? The answer comes out as the the ninety-two Johnson solids (with a few near misses). …and if we forget about convexity now? There are infinitely many possibilities, obtained by gluing Johnson solids together. For example, if you start with an octahedron and glue a tetrahedron on each face, you get a stella octangula. This process can be repeated indefinitely. What’s more, we lose simple-connectedness again, and discover more solids with holes in them: the Stewart toroids appear, along with higher genus variants. Still not satisfied? Let’s generalise to higher dimensions. 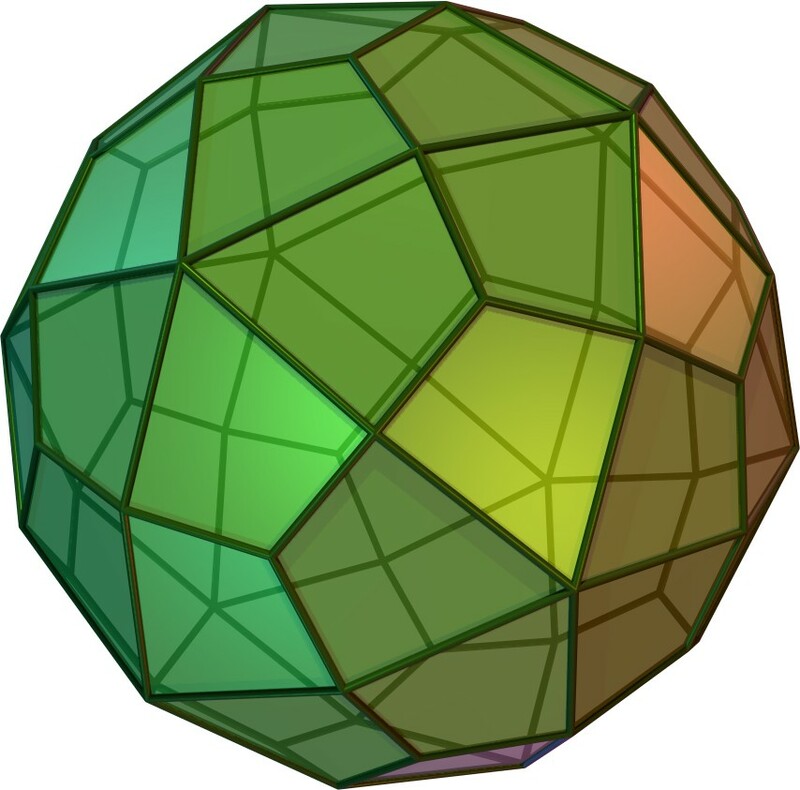 Meet the pentachoron (pictured), tesseract, hexadecachoron, icositetrachoron, hecatonicosachoron, and the hexacosichoron: the 4-dimensional analogues of the Platonic solids. Now we can start all over again! Did someone say ‘non-convex’? The 4-dimensional analogues of the Kepler-Poinsot polyhedra are the ten Schläfli-Hess polychora. And here are the sixty-four convex uniform polychora, plus two infinite families of prismatic forms. What’s the point of all this? Firstly it’s to demonstrate that Wikipedia truly is an excellent resource for mathematics these days (although it has its limits). Secondly it’s to illustrate the interdependence of funky maths (in this case mad shapes) with seemingly dry maths (notions such as vertex-transitivity). Without all the hard thinking, we’d never attain full funkiness. More precisely, it’s to give an example of what mathematicians mean when they say ‘generalise’: when you look at a Platonic solid, there are many valid observations you could make. You can pull any of these criteria out, consider them on their own, and then see what else you can find that fits the bill: and that could be the first step on a very long, and very rich journey. Or fifteen if you count the left- and right-handed versions of the snub cube and snub dodecahedron separately. 75 if you discount Skilling’s figure where some pairs of edges coincide. Fifteen if you count the left- and right-handed versions of the pentagonal icositetrahedron and pentagonal hexecontahedron separately. Imagine two edges meeting at a vertex and bounding a face. There are two different ways those edges could be matched up. What happens to the vertices and faces in those two cases? If you click on it it rotates. Animation created by Jason Hise, taken from Wikipedia.